Garsington Opera is located on the Wormsley Estate, home of the Getty family. The Estate is a splendid example of an English pastoral scene. Along with a new pavilion for its performances, Garsington Opera were looking for elegant fabric structures to house its restaurant and picnic facilities. The new Marquees needed to be in keeping with the pavilion’s contemporary style as well as taking themes from a traditional English setting. 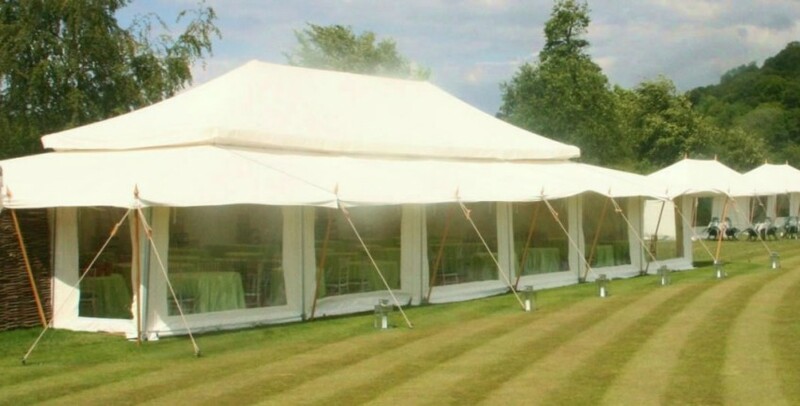 To provide Garsington Opera with stylish Marquees in keeping with their clientele and setting. BARKERS’ Marquees Solution – Hitting the right note! BARKERS Marquees designed and manufactured a Restaurant Marquee, series of Picnic Marquees and ‘Punch and Judy’ style Programme Booths. The fabric structures were made from traditional materials such as Polycotton fabrics and Wooden Wall Poles and finials; with a modern design tying in with Garsington’s new performance pavilion. The Restaurant Marquee boasts a double tiered canopy, giving the structure a feeling of space and light inside. Garsington Opera runs for a short summer season and produces opera of the highest professional quality in a setting of extraordinary beauty at Wormsley, in the Chiltern Hills. It has championed rarely performed works of artistic interest and high musical quality as well as mounting productions of the core repertory. Garsington Opera gives performing opportunities to the finest young singers in the country and engages conductors and stage directors of distinction. In the long dinner interval patrons can picnic in the grounds or using the Picnic Marquees or a rug beside the lake, or dine in the restaurant marquees overlooking the famous Wormsley cricket pitch. Garsington Opera offer catering by Jamie Oliver’s Fabulous Feasts.